Draft: 2011, Toronto Blue Jays, 2nd rd. Resides in Johnson City, TN during the offseason...Helped to raise money for a project called "Jacob's Nature Park at Sinking Creek", an outdoor learning center in his hometown of Johnson City, TN; participates in the Autographed Memorabilia Donation program; participated in the Tigers Winter Caravan and TigerFest...Attended Science Hill High School, where he went 33-3 during his career, including an 8-2 record with a 2.24 ERA and 123 strikeouts as a senior. Limited to 11 appearances, including eight starts, with Detroit in 2018 due to injury...Pitched out of the bullpen on April 5 at Chicago (AL), striking out six and allowing just one run in 3.1 innings...Sidelined from April 30-September 1 with a left groin strain...Struck out a season-high eight batters in his final start of the season on September 29 at Milwaukee...Selected to pitch for the MLB All-Stars in their trip to Japan in November...appeared in three games and did not allow a run in 3.1 innings...also started three games for Aguilas Cibaenas of the Dominican Winter League and had a 0-0 record with a 1.84 ERA (14.2IP/3ER) and 12 strikeouts. Established career highs with 22 appearances, 101.2 innings pitched and 86 strikeouts in 2017 with the Tigers...Allowed four earned runs on April 20 at Tampa Bay, snapping his streak of allowing three earned runs- or-less at 21 consecutive starts...also took the loss in the game at Tampa Bay, which was Norris' ?irst loss in 17 road starts to begin his career...the streak of 16 road starts without a loss to start his career was tied with Todd Wellemeyer and Larry Jensen for the second-longest streak since 1913...Sidelined from July 6-September 1 with a left groin strain...Recorded the 200th strikeout of his Major League career on September 13 at Cleveland. Split the 2016 season between Detroit and Triple A Toledo -- posted a 5-7 record with a 4.54 ERA (73.1IP/37ER) and 77 strikeouts in 14 starts with the Mud Hens, while he was 4-2 with a 3.38 ERA (69.1IP/26ER) and 71 strikeouts in 14 appearances, including 13 starts, with the Tigers... Placed on the 15-day disabled list on April 2, retroactive to March 25, with a lower back strain... Began an injury rehab assignment with Single A Lakeland on April 10 -- made four injury rehab starts between Lakeland and Triple A Toledo and had a 0-1 record with a 5.06 ERA (16.0IP/9ER) and 18 strikeouts... Reinstated from the 15-day disabled list and optioned to Triple A Toledo on April 26... Recalled from Triple A Toledo on May 11... Optioned to Triple A Toledo on May 12...Threw a season-high 7.0 innings on May 16 at Buffalo…also threw 7.0 innings on June 17 vs. Rochester and August 4 at Louisville...Started four games for Toledo in June and compiled a 2-2 record with a 3.33 ERA (24.1IP/9ER) and 25 strikeouts...Recalled from Triple A Toledo on June 23. • Placed on the 15-day disabled list on July 5 with a right oblique strain...Began an injury rehab assignment with Triple A Toledo on July 18 -- made three injury rehab starts between Toledo and Double A Erie and had a 1-1 record with a 5.28 ERA (15.1IP/9ER) and 14 strikeouts... Activated from the 15-day disabled list on August 2 and optioned to Triple A Toledo...Recalled from Triple A Toledo on August 8... Established a career high with 11 strikeouts on September 12 vs. Minnesota... Started five games with the Tigers in September and had a 2-0 record with a 2.73 ERA (29.2IP/9ER) and 38 strikeouts... Allowed three earned runs-or-less in all 13 starts with Detroit during the season and has now given up three earned runs-orless in 19 consecutive starts dating back to August 12, 2015 -- the streak is the longest active streak in the majors...Lefthanded hitters posted a .214 (15x70) average, while righthanders batted .290 (60x207) against him this season... Posted a 1-2 record with a 3.86 ERA (37.1IP/16ER) and 39 strikeouts in seven starts at home, while he went 3-0 with a 2.81 ERA (32.0IP/10ER) and 32 strikeouts in seven starts on the road...Compiled a 1-0 record with a 4.85 ERA (13.0IP/7ER) in four games, including three starts, prior to the All-Star break, while he went 3-2 with a 3.04 ERA (56.1/19ER) and 55 strikeouts in 10 starts following the All-Star break. Began the 2015 season in the Toronto Blue Jays organization before being acquired along with Matt Boyd and Jairo Labourt in exchange for David Price on July 30. Made 13 starts between the Tigers and Blue Jays and had a 3-2 record with a 3.75 ERA (60.0IP/25ER) and 45 strikeouts. Began the season with the Toronto Blue Jays, marking the first time in his career he has made an Opening Day roster. Earned the first win of his major league career on April 9 at the New York Yankees, allowing three runs on six hits with two walks and five strikeouts in 5.2 innings. Established a career high with seven strikeouts on April 25 at Tampa Bay. Optioned to Triple-A Buffalo by the Blue Jays on May 1 -- made 16 starts with Buffalo and had a 3-10 record with a 4.27 ERA (90.2IP/43ER) and 78 strikeouts. Allowed three earned runs or fewer in each of his first nine starts with Buffalo from May 6-June 18 -- during the stretch he had a 3.44 ERA (49.2IP/19ER) and 51 strikeouts. Made his Tigers debut on August 2 at Baltimore and earned the win, tossing a career-long 7.1 innings and allowing one run on four hits with one walk and five strikeouts. Hit a home run in his first professional plate appearance, a two-run home run in the second inning on August 19 at the Chicago Cubs off of Jon Lester to record his first major league hit, home run and RBI -- became the first Tiger pitcher to hit a home run in a game since Jason Johnson on June 8, 2005 at the Los Angeles Dodgers and the first American League pitcher to hit a home run at Wrigley Field. Sidelined from August 20-September 16 with a right oblique strain. Threw 5.0 perfect innings and struck out four batters in his start on September 22 vs. the Chicago White Sox. Posted a 1-0 record with a 1.76 ERA (15.1IP/3ER) and 11 strikeouts in four starts after his return from the disabled list. • Compiled a 0-2 record with a 6.19 ERA (16.0IP/11ER) and 12 strikeouts in four home starts...went 3-0 with a 2.86 ERA (44.0IP/14ER) and 33 strikeouts in nine starts on the road. Posted a 1-0 record with a 1.57 ERA (23.0IP/4ER) and 14 strikeouts in five starts against AL Central opponents...AL Central foes batted .152 (12-for-79) against him. Lefthanded hitters posted a .259 (15-for-58) average against him...righthanders batted .228 (38-for-167) with him on the mound. Appeared in five games for Toronto, making one start. Made his Major League debut on Sept. 5 at BOS...Struck out David Ortiz, the only batter faced in the 7th inning preserving a 4-3 lead. Made his first career start on Sept. 25 vs. SEA... Allowed two runs in 3.1 IP, receiving a no-decision in a 7-5 loss. Was 2nd among TOR MILB pitchers in wins (12-2 record) and strikeouts (163). Was selected to the SiriusXM All-Star Futures Game, and pitched a clean 2nd inning for the U.S. Team, with one strikeout. Spent time at three levels in 2014, starting in Dunedin (High-A), earning a selection to the Florida State League Mid-Season All-Star Team, before stops in New Hampshire (AA) and Buffalo (AAA). Was named to Baseball America's First Team Overall Minor League All-Star Team. Became the first Bisons pitcher in the modern era to strikeout 10+ in consecutive starts (Aug. 10-15) ... Fanned 13 of his 19 batters faced on Aug. 15 one shy of Bisons record ... Overal with Buffalo fanned 38 of 85 batters (44.7%). Had arthroscopic surgery on October 7 to remove bone spurs and loose bodies from his left (pitching) elbow. On January 21, 2015 was named by MLB as the third-best LHP prospect in baseball. November 13, 2018 Aguilas Cibaenas placed LHP Daniel Norris on the reserve list. October 13, 2018 LHP Daniel Norris assigned to Aguilas Cibaenas. September 1, 2018 Detroit Tigers activated LHP Daniel Norris from the 60-day injured list. August 26, 2018 Detroit Tigers sent LHP Daniel Norris on a rehab assignment to Toledo Mud Hens. August 21, 2018 Detroit Tigers sent LHP Daniel Norris on a rehab assignment to Lakeland Flying Tigers. August 16, 2018 Detroit Tigers sent LHP Daniel Norris on a rehab assignment to GCL Tigers West. August 11, 2018 Detroit Tigers sent LHP Daniel Norris on a rehab assignment to GCL Tigers East. 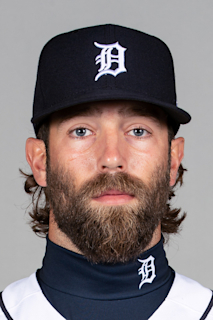 August 2, 2018 GCL Tigers East activated LHP Daniel Norris. May 8, 2018 Detroit Tigers transferred LHP Daniel Norris from the 10-day disabled list to the 60-day disabled list. Left groin strain. April 30, 2018 Detroit Tigers placed LHP Daniel Norris on the 10-day disabled list. Left groin strain. September 1, 2017 Detroit Tigers activated LHP Daniel Norris. August 16, 2017 sent LHP Daniel Norris on a rehab assignment to Toledo Mud Hens. August 16, 2017 Detroit Tigers sent LHP Daniel Norris on a rehab assignment to Toledo Mud Hens. July 18, 2017 Detroit Tigers sent LHP Daniel Norris on a rehab assignment to Toledo Mud Hens. July 6, 2017 Detroit Tigers placed LHP Daniel Norris on the 10-day disabled list. Left groin strain. August 8, 2016 Detroit Tigers recalled LHP Daniel Norris from Toledo Mud Hens. August 2, 2016 Detroit Tigers optioned Daniel Norris to Toledo Mud Hens. August 2, 2016 Detroit Tigers activated LHP Daniel Norris from the 15-day disabled list. July 28, 2016 Detroit Tigers sent LHP Daniel Norris on a rehab assignment to Erie SeaWolves. July 18, 2016 Detroit Tigers sent LHP Daniel Norris on a rehab assignment to Toledo Mud Hens. July 5, 2016 Daniel Norris roster status changed by Detroit Tigers. June 23, 2016 Detroit Tigers recalled LHP Daniel Norris from Toledo Mud Hens. May 13, 2016 Detroit Tigers optioned LHP Daniel Norris to Toledo Mud Hens. May 11, 2016 Detroit Tigers recalled Daniel Norris from Toledo Mud Hens. April 26, 2016 Detroit Tigers optioned LHP Daniel Norris to Toledo Mud Hens. April 18, 2016 Detroit Tigers sent LHP Daniel Norris on a rehab assignment to Toledo Mud Hens. April 10, 2016 Detroit Tigers sent LHP Daniel Norris on a rehab assignment to Lakeland Flying Tigers. April 2, 2016 Daniel Norris roster status changed by Detroit Tigers. September 16, 2015 Detroit Tigers activated LHP Daniel Norris from the 15-day disabled list. July 31, 2015 Detroit Tigers activated LHP Daniel Norris. May 1, 2015 Toronto Blue Jays optioned LHP Daniel Norris to Buffalo Bisons. September 2, 2014 Toronto Blue Jays recalled Daniel Norris from Buffalo Bisons. August 31, 2014 Toronto Blue Jays selected the contract of LHP Daniel Norris from Buffalo Bisons. August 31, 2014 Toronto Blue Jays optioned Daniel Norris to Buffalo Bisons. August 9, 2014 LHP Daniel Norris assigned to Buffalo Bisons from New Hampshire Fisher Cats. July 19, 2014 New Hampshire Fisher Cats activated LHP Daniel Norris from the temporarily inactive list. July 12, 2014 New Hampshire Fisher Cats placed LHP Daniel Norris on the temporarily inactive list. June 16, 2014 LHP Daniel Norris assigned to New Hampshire Fisher Cats from Dunedin Blue Jays. August 30, 2013 LHP Daniel Norris assigned to Dunedin Blue Jays from Lansing Lugnuts. July 8, 2013 Daniel Norris roster status changed by Lansing Lugnuts. June 10, 2013 Lansing Lugnuts placed LHP Daniel Norris on the 7-day disabled list. April 1, 2013 LHP Daniel Norris assigned to Lansing Lugnuts from Vancouver Canadians. August 25, 2012 Daniel Norris assigned to Vancouver Canadians from Bluefield Blue Jays. June 17, 2012 Daniel Norris assigned to Bluefield Blue Jays. August 15, 2011 Toronto Blue Jays signed LHP Daniel Norris.